Deep Blue C Facial Oil review – Inner Senses – weekly product feature. 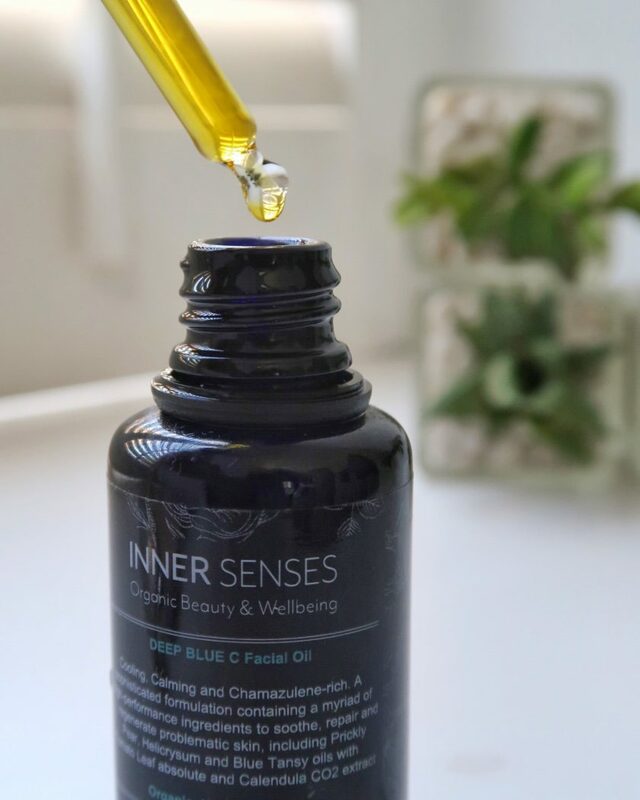 Organic beauty & wellbeing brand Inner Senses is launching today new oil, Deep Blue C Oil, which was developed for problematic skin. I’ve was able to use it for over two months. After a test run on both good and bad skin days here is the product verdict. Deep Blue C Facial Oil the results. The oil is rich, thicker than some other oils I’ve used in the past but despite the texture, it absorbs into the skin. I have combination skin, which is mostly clear nowadays but there are days when my skin flares up for no reason with tiny red spots. When I used the oil on the bad skin day it made the biggest difference to skin inflammation. I used Deep Blue C Oil at nighttime after cleansing. Usually, after using it at night I woke up with calmer skin. Most of the redness was gone and skin appeared clear. The rich texture means you need a small amount for the entire face. I used about 4-5 drops, which I warmed up in my hands before pressing onto my skin. I find oils best when applied alone to the skin, therefore I’d only use them a few nights a week. Alternatively, I’d replace my night cream with an oil for a week or so, to achieve faster results. The product has distinctive sent but this fragrance is natural and comes from the essential oils used to make the oil. Where your Deep Blue C Facial Oil comes from? Inner Senses face and body oils are hand blended. All Inner Senses product use only the purest, ethically sourced organic ingredients and are vegan and cruelty-free. This face oil is the only product I’ve used but there are also body oils available. You can buy Inner Senses from the Inner Senses Website or from www.lovelula.com. Clarins Autumn 2018 Makeup Collection review. 5 exercises to strengthen your booty & glutes for running.